The AST Endurance™ Filter is an advancement of our patented PolyGeyser® technology with the addition of many new enhancements and increased performance features. For questions call: 800.939.3659 or send us a message. 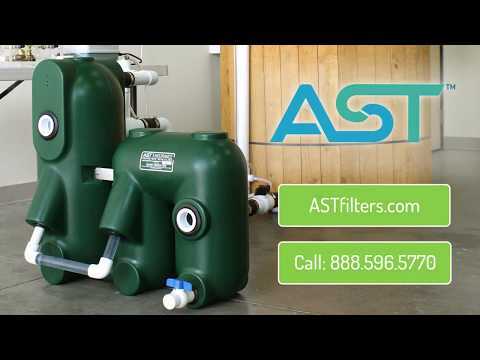 AST Endurance filters are ideal for ponds or tanks 200 to 4000 gallons in size and are designed for use in KOI, Aquaponic, Fingerling and small Growout applications. The tables below shows the approximate sizes of ponds, tanks and aquaponic systems the Endurance models will support. They also work beautifully for aquaponics applications. The Endurance filters separate out solids in the water and store them in a large sludge chamber. The integrated chamber allows partial mineralization for plant nutrients. This nutrient rich water can then be automatically released to plant grow beds as part of the backwash process. The amount of water and delivery frequency can be easily adjusted to keep your nitrate levels ideal for fruiting or green growth. If you are looking for an integrated tank and filter also popular for aquaponics, check out the AST FIT 400 SYSTEM. This AST Endurance unit is being utilized in a small-scale, home aquaculture project for raising tilapia. The customer set up the filter in his greenhouse and insulated the tank with wooden boards to regulate the temperature of the water. For optimal energy savings, the Endurance unit was configured with an airlift operation utilizing no motorized pumps or mechanical moving parts. Sludge is concentrated in the chamber and then automatically dumped into a nearby bucket allowing for easy maintenance. The water flows downward through the mixing bead bed and more solids are washed from the beds to settle towards the bottom. The downward flowing water sweeps into the middle compartment, flushing the solids that have accumulated on the bottom of filter and depositing them into the sludge basin. The water level rises in the shorter chambers.